We live in the age of the Internet, of globalization and competitiveness. Technology has an increasing worth placed on it, and people are more and more practical and competitive. In this modern world it seems there is no room for folklore. However, many people do not realize that folklore remains a part of our lives. Have you noticed that many Brazilians are afraid of walking under a ladder or of mixing mango and milk? Our forefathers also had the same fears. This superstition about the ladder and the myth about food and drink (mango + milk) are part of our folklore. When we eat feijoada, or we drink chimarrão, we are consuming our folklore’s typical cuisine. Certain things we say, or songs we sing, in our everyday lives were also said and sung by our forefathers. When we go to a Festa Junina we are enjoying ourselves at a party created many centuries ago. These are just some examples of how folklore is part of our day-to-day life. Brazilian folklore is very rich, as it is based on the cultural heritage left by Portuguese colonizers, by Africans and by European immigrants. These people spread around the various regions of Brazil throughout the centuries. This is why every State has different forms of folklore. In 1846 the Englishman William John Thoms created a word that later would be used by people all over the world. William joined the words “folk” (people) and “lore” (knowledge) and so the word “folklore” came to be, which means a people’s customs (or knowledge). In Brazil Folklore Day is celebrated on 22nd August. Cuisine – Feijoada, bolinho caipira, baião-de-dois, café tropeiro, cocada, acarajé and chimarrão. Parties – Festa Junina, Festa do Divino, Folia de Reis and Círio de Nazaré. 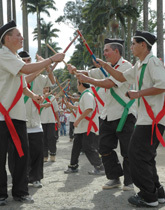 Music and dance – forró, frevo, baião, maracatu, capoeira, catira, afoxé and moçambique. 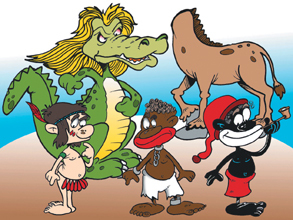 Mythological characters – Saci-Pererê, Curupira, Mula-sem-cabeça, Cuca and Negrinho do Pastoreio. Toys and games – kites (pipas), spinning tops (pião), hide-and-seek (esconde-esconde), and queimada. Folklore Month Revives Saci, Cuca & Co.
SACI PERERÊ - Saci Pererê is a smart kid that lives in the forest and has only one leg. He uses to walk at nights and he likes to play tricks on animals and hide toys from the kids. Saci wears a red hood and hold a pipe in his mouth. CURUPIRA - Curupira is ugly, with green teeth and he has a different way to walk as if he were walking backwards. He protects the forests, the woods and the animals, scaring away hunters and passers-by. This mythic character appeared in the North. CUCA - Certainly the best known myth of childhood fears (remember the song - “Nana neném que a Cuca vem pegar...?”). It is said that Cuca would take kids to a mysterious and distant farm to be devoured or used in some kind of magic. In Monteiro Lobato’s books, Cuca took the form of a great big green alligator. MULA SEM CABEÇA (The Headless Mule) - The headless mule, so the story goes, appeared out of the romance between a woman and a priest. This forbidden love came at a high cost to the beautiful woman: she was punished by being turned into a mule. Not just a normal mule, you understand, but a mule with fire in the place of its head, a mule which only appears at night on Thursdays or Fridays when there is a full moon. NEGRINHO DO PASTOREIO - There is a legend that says the Negrinho do Pastoreio is pure, without sin, and a good angel. He lives to find things that we have lost and to put them where they can be found. BOTO - A well-dressed, handsome, dancing man who appears at night to charm the girls and take them to the banks of the Amazon river where they become pregnant. However, before dawn the man turns into an Amazon river dolphin and disappears into the waters. When night falls, the story repeats itself.